Every year somebody says; "there's no way this game will do as well the last one." And every year they're wrong. 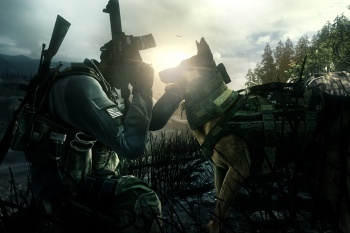 The fix is in: Call of Duty: Ghosts global sales topped $1 billion dollars on day one, according to publisher Activision. Though the publisher is quick to boast about the figure, they have not yet released specific sales figures, including the number of units shipped or sold. Activision was also quick to point out that Ghosts is currently the number one game on Xbox Live and the most pre-ordered game at GameStop, which held 15,000 midnight openings Tuesday morning. "This is the must have launch title for the next generation of consoles," says Activision Publishing CEO Eric Hirshberg, "and we expect Call of Duty: Ghosts to be the most successful launch title for the Xbox One and PS4 by a wide margin. In fact, according to GameStop, Call of Duty: Ghosts is their most pre-reserved next gen title." Call of Duty: Ghosts is currently available on Xbox 360, PS3, Wii U and PC. The game will launch alongside both the PS4 and Xbox One. Despite some single-player struggles, we found that Ghosts has plenty to offer: Check out our review for the full report. Correction: Activision's statement refers to retailer to "sell-in" sales from publisher to retail, not generated at retail. As such, it has not actually broken any sales records.